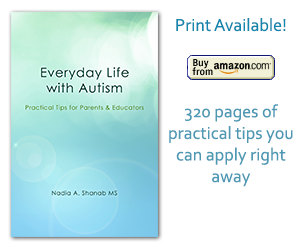 It might seem to be a simple request to ask a child with autism to write down a paragraph or even a sentence or two. According to Kathy Oehler, a Speech and Language Pathologist, the process of writing is a very complex task. It engages and sollicits several parts of the brain to work simultaniously in harmony. Almost like a conductor leading an orchestra, commanding each musician to perform individually to ultimately be in sync with all other musicians. That explains why many kids with autism get really frustrated when asked to do a written assignment. It is a complex task that takes training and a lot of patience. Let’s see what are these four factors that need to cooperate to help the child successfully achieve the goal of handwriting. Don’t be abstract. Give examples about what the child is supposed to write about. So, instead of asking the child: “What have you done this weekend?” ; you may aske her/him: “Did you stay at home or did you go to your friend’s house…”; and if the child has stayed at home give options like: “Have you helped your mom doing… or did you play Wii with your brother…?” Try to support your options with visual aides. You are creating a mental picture to make the child elaborate and build ideas around it. To organize the ideas it would be helpful to use the visual skills of the child by displaying/showing/drawing a chronological sequence of the events using eiher picture or brief words. Then let her/him write about each picture or word one after the other. Get the child started by hand-over-hand support then withdraw gradually. You may also give physical prompts to older children to get them started. Shifting the attention to start the writing process takes a lot of mental effort. A physical activity prior to a writing task might be beneficial. Also, try to filter out all the noises, smells, lights, and other sensory elements that might disturb the writing process. Besides, the appropriate and comfortable posture and seating contributes to the success of the writing process.